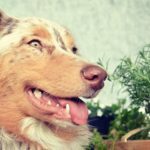 Home » Dog Breeds » Is a Pomeranian Right for You? Pomeranians are the 22nd most popular dog breed in the United Stated, according to the American Kennel Club. What makes this tiny fluff ball of a dog so popular? More importantly, is a Pomeranian right for you? As a member of the Spitz family, Pomeranians are lively, spirited, and bold. Do not let their small package fool you, as they often forget their own size in an attempt to intimidate larger dogs. Pomeranians are also highly alert, and can develop a barking habit if this behavior is reinforced. Members of the Toy Group, Pomeranians are small dogs that weigh 4 – 8 lbs. They have thick double coats thanks to their northern European heritage, and shed frequently. In order to properly maintain the Pomeranian’s coat, daily brushing is recommended as well as professional grooming every 6 – 8 weeks. 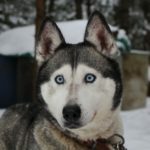 There are 18 recognized colorings for this breed, including shades of red, black, blue, sable, cream, merle, and orange. Pomeranians are outgoing and friendly dogs yet can be bossy with other animals, particularly when they become jealous for their owner’s attention. However, with proper socialization they can be wonderful pets in multi-animal households, so long as the other animals respect the Pomeranian’s small size. The bold nature of the Pomeranian makes training a necessity for this breed. Pomeranians are highly intelligent dogs and are eager to learn. They also excel in certain dog sports such as tracking and agility. 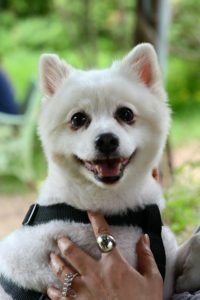 Small dogs are easy to overfeed, as their calorie requirements are much less than that of a medium or large-sized dog. Pomeranian owners should be careful not to over-feed their pets, as obesity can cause disastrous bone and joint problems, as well as thyroid and organ disorders. Pomeranians are also prone to poor dentition and early tooth loss, so a wet food may be necessary later in life in order to lessen food-related pain. Pomeranians are active dogs, yet can be easily exercised with vigorous play sessions in the house or quick walks around the neighborhood. For this reason, Pomeranians make excellent companions for apartment-dwellers. When given proper routine care (i.e. regular grooming, ear, and eye cleanings) Pomeranians can live long and healthy lives with typical life spans of 12 – 16 years. 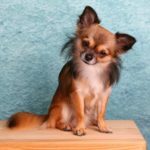 While Pomeranians are at low risk for hip dysplasia thanks to their small stature, other joint conditions, such as a luxating patella, are common. As with most small breeds, tracheal collapse is another common concern. Here, the tracheal muscles of the windpipe weaken, causing the airway to collapse and prevent the normal flow of oxygen. When this problem occurs, the dog may wheeze, “honk,” faint, or develop exercise intolerance. Black Skin Disease affects Pomeranians disproportionately from other breeds. This condition is characterized by a darkening of the skin and hair loss. Additionally, merle colored Pomeranians are more prone to disease, including deafness, ametropia, colobomas, and diseases of the skeletal, cardiac, or reproductive system. Overall, Pomeranians are great family companions when properly trained and socialized. Although their coat is high maintenance, they require little exercise or additional care.